Oranges of all kinds are nutritious and tasty. If your backyard is large enough to support a tree that will attain a spread of 15 to 20 feet, you can grow a standard-size navel orange tree. If you have less space, you can still enjoy the fresh fruit that a dwarf navel orange tree will produce. The Washington, or “Bahia,” navel orange is a common variety grown in home gardens as well as in commercial orchards, especially in southern California. It arrived in the United States from Brazil around 1820; early growers introduced it to Florida in 1835. 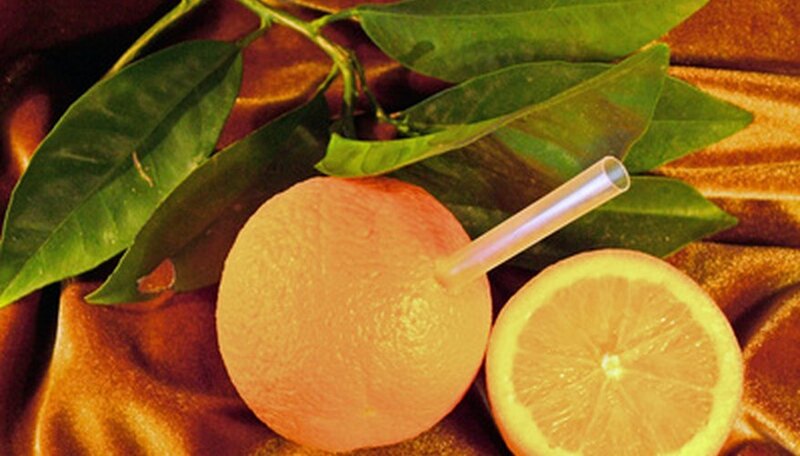 Because navel oranges do not have seeds, propagators must graft the naval orange onto a different type of orange’s rootstock. This practice was used in the 1800s and the first budded navel orange trees arrived in California in 1873. By the mid 1880s, the navel orange was a prospering commercial venture in the Riverside, Calif., area. At five years of age, standard navel orange trees typically reach a height of 11 feet. Several years later, when they reach their maximum height, they can reach 15 to 20 feet if you leave them unpruned. The evergreen leaves are deep green and glossy, and when the tree is in bloom, a pleasant fragrance scents the air. The full-size Washington navel orange tree grows best in areas where the summer is not excessively hot: in tropical areas, it does best at higher elevations of at least 3.300 feet. The dwarf navel orange tree grows to a maximum height of 6 feet. Their compact size makes them well adapted to growing in containers, which you can move to a protected area if your winters receive heavy frost. The dwarf variety is less likely to develop root rot than the larger tree, but it is still important to grow it in an area where the soil drains well. Like the larger navel orange, the dwarf has glossy, deep green leaves that are evergreen. Leaf size differs little from the size of standard size navel orange tree leaves. The trifoliate orange comes from China, and although it is not considered edible, it provides good rootstock for grafting navel orange trees. Trifoliate oranges are called karatachi in Japan. Growers prefer to use this species as rootstock because it provides better resistance to a common citrus disease known as phytophthora foot rot, which occurs when soil remains wet for prolonged periods of time. Trifoliate trees are also more tolerant of frost than most other orange trees, which gives the rootstock an advantage when growers use it for grafting both full size and dwarf navel oranges. The fruit of both standard-size navel oranges and dwarf navel oranges is large—full size trees produce fruit that can weigh up to 3/4 pound, while dwarf varieties produce slightly smaller fruit that usually weighs a bit over 1/2 pound. The peel, or rind, is thick, which makes it easy to remove by hand. Dwarf navel orange trees yield a smaller harvest than their larger brothers. The University of Florida Citrus Research and Education Center determined that a mature dwarf tree produces 200 pounds of fruit over a five-year growing period, while the full size tree produces 700 pounds over the same time span.